How Safe Is a Roller Coaster in the Sky? G-Force One is a modified Boeing 727 for commercial weightless flights. Last week's announcement by the Zero Gravity Corporation that it would be offering weightless flights to paying customers was good news for thrill seekers. Those who sign up for the experience will be treated to several stomach-rolling climbs and drops. Although the planes used are slightly modified commercial planes, tests have shown that they can manage the demanding maneuvers. "It is definitely an unusual flight trajectory," said Peter Diamandis, Chairman and Chief Executive Officer of Zero Gravity. "But it is not a dangerous flight trajectory." The flight path traces out a series of parabolas, strung together in a wave-like pattern. At the crests, passengers experience zero gravity, while, at the troughs, their weight nearly doubles. 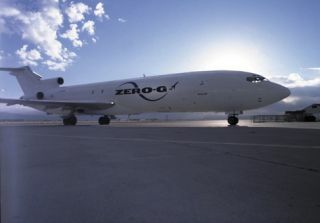 Zero Gravity chose the Boeing 727 cargo plane to launch passengers briefly into the air. Some changes were necessary, but for the most part the weightless flights did not supersede the original design specifications of the plane. "There's more stress landing on a windy day than on one of these parabolic flights," said Noah McMahon, spokesperson for Zero Gravity. A trip on G-Force One, the company's primary plane, is a bit like a roller coaster without the track or the safety harness. The aircraft climbs with its nose pointed 45 degrees up. At 34,000 feet, it levels off smoothly before diving down to 24,000 feet, with a maximum descent angle of about 30 degrees. Customers on G-Force One are offered about 15 of these up-and-down cycles, each lasting about a minute. But not all of the peaks achieve zero gravity. To acclimatize the passengers, some of the early parabolas reduce gravity to mimic the feeling on Mars (1/3 g) and the Moon (1/6 g), where 1g is the gravity felt standing on the surface of the Earth. Flight operations will be conducted out of Fort Lauderdale, FL, by Amerijet International, Zero Gravity's partner. Currently G-Force One is on a two-week tour of the country. Space and military agencies around the world have been flying parabolic flights for 45 years apparently without incident - besides an occasional lost lunch. Zero Gravity says that NASA alone has conducted more than 150,000 parabolas in training astronauts for space flight and conducting research. Ron Howard was able to film some of the scenes for Apollo 13 on the so-called "vomit comet." Different aircraft have been employed to simulate weightlessness. NASA uses the KC-135, which is the military's version of the Boeing 707. Zero Gravity looked at several possible aircraft, including the Boeing 707, 727, 737, and 757, as well as the DC-9. They settled on the Boeing 727-200, which is used extensively as a cargo carrier. One reason for choosing this aircraft is its similarity in size to the KC-135, but with a large cargo door that allows for easy alteration of the interior. Other advantages were the availability of replacement parts and the fact that the plane's design allowed for a smooth parabola. The Boeing 727 is certified to withstand between +2.5g and -1g. A parabolic flight aboard G-Force One goes from +1.8g to 0g, well within the tolerances of the Boeing 727. Still, the Federal Aviation Administration had to approve Amerijet International to operate such flights for the general public. That process, which included evaluations of subsystems and about 1,000 parabolas in test flights, took nearly two years. "I think the main concern was with the aircraft frame," said Paul Takemoto, an FAA spokesperson. To determine the stresses that parabolic flight might impart on the frame, strain gauges were implanted in G-Force One's outer shell. This helped engineers construct an elaborate computer model to simulate the wear and tear multiple parabolic flights could induce. After viewing all the relevant data and documents, the FAA determined that no structural modifications to the 727 were necessary. The FAA did require that an enhanced hydraulic system be put on the plane. This was to prevent air from getting in the lines during the rapid changes in pressure, Diamandis said. They also stipulated that inspections be done more often than for gravity-respecting aircraft. "We follow more stringent guidelines than a normal commercial flight," McMahon said. Takemoto added that the parabolas must occur above 24,000 feet, and the operators must inform the FAA when and where the weightless portion of the flight will be performed, so that air traffic controllers can set up a dedicated space 100 miles long and 10 miles wide. "In that block of air space, we are given free reign," Diamandis said. The FAA did allow for two exemptions in its first-ever approval for weightless flight service on a commercial basis. Generally, flights that involve pointing the nose above or below 30 degrees from horizontal are considered aerobatic and thereby require the wearing of parachutes. But the FAA has permitted Amerijet and Zero Gravity to fly the parabolic maneuvers without strapping parachutes on all the passengers. Diamandis said this would not reduce the safety. "You're flying at an altitude that you wouldn't be able to use a parachute," Diamandis said. "The safest thing to do -- if there's a problem -- is to come back and land, just like a regular flight would." Diamandis added that NASA's KC-135 flies its parabolas without the wearing of parachutes. The other FAA exemption involved drop-down oxygen masks, which any plane flying over 25,000 feet is required to have. G-Force One will have oxygen masks below passenger seats, and in the separate floating area, but the FAA did not require an automatic system. The reason that the drop-downs are not necessary, said Diamandis, is that there are seven crewmembers on a G-Force One flight looking after 27 passengers. In contrast, a flight attendant on a commercial airplane can be responsible for as many as 50 passengers. Asked whether these parabolic flights will be as safe as normal commercial flights, Takemoto said, "If they operate within the parameters that we set out, yes, they will be safe."